The survival of Asian Elephants is threatened by loss of forest habitat and the ever-increasing human population. World Land Trust (WLT) works with local partners, Wildlife Trust of India (WTI), to purchase and protect corridors of land which form part of traditional Elephant migratory routes. WTI have identified 88 such corridors, all vital if Asian Elephants are going to continue to breed and exist into the future. 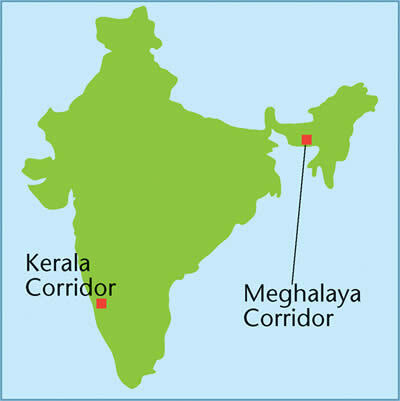 WLT is currently assisting WTI on the purchase and protection of two elephant corridors: The Siju-Rewak corridor in the Garo Hills of NE India in Meghalaya state, and the Tirunelli-Kudrakote corridor which runs through Wayanad district of Kerala. Other vital corridors are in need of protection too – see below. WLT has, so far, helped protect two wildlife corridors: one in Garo Hills, Meghalaya state in NE India and the other in the Western Ghats montane forests in Kerala. In both cases there is growing concern among local people that elephants are left in peace and that they themselves are better off away from the corridor areas where they live in daily fear of their crops and houses being wrecked. WTI works with local communities to identify alternative land away from elephants and helps build new houses for them. 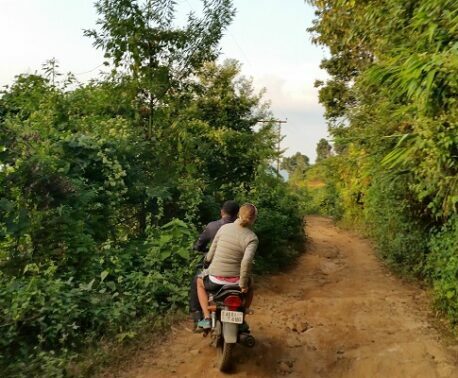 The corridors are then reforested using native tree species which are grown, planted and tended by local people, bringing extra income for themselves and their families. WLT's first challenge was to raise the funds to secure the Siju-Rewak Elephant Corridor, in the Garo Hills of NE India. This was successfully achieved, and now protects 1,700 acres (over 700 ha) of continuous forest for elephants and other wildlife. This corridor was especially important as it also protects a vital crossing point over the Simsang River. Building on the success of this project WLT and WTI are reforesting and restoring forest corridors in other parts of the Garo Hills, to benefit Elephants. Community lands in the West Garo Hills have been systematically deforested and intensively cultivated, causing devastating loss of habitat for Elephants and other endangered species such as the Hoolock Gibbon, Tiger and Clouded Leopard, which are all present in this region. As a result of relentless slash-and-burn agriculture the land eventually becomes unproductive and local communities are now recognising the benefits of keeping forested areas. 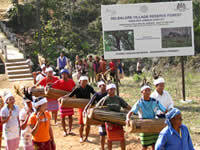 In a pioneering project communities are voluntarily transferring small areas of their lands for conservation purposes. WLT and WTI's first job will be to designate these areas as Village Forest Reserves and then undertake planting to restore tropical forest. 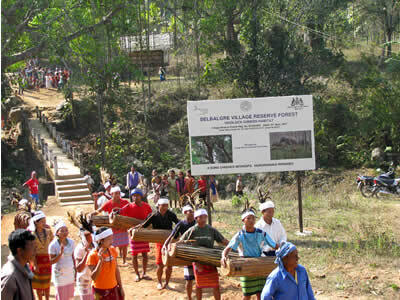 The first Village Forest Reserve was set up in 2008 at the village of Selbalgre, after villagers realised that forest cover benefitted their cultivation practices by stabilising the soils and increasing water retention in the land. At least seven new areas have been identified for reforestation and, once protected, they will form a continuously forested wildlife corridor between Nokrek National Park and Selbalgre Village Reserve. A growing number of communities are seeing the positive impacts of conserving some of their tribal lands and it is hoped that more reforestation will be possible. As a means of providing alternative sustainable food sources for the people of Selbalgre, WTI have encouraged the installation of fish pools for the preservation of the endemic fish species of the region. These and other community development activities, including repair of school buildings and provision of teaching materials, will be carried out during 2009. Elephant corridors provide a safe habitat for many other species of endangered wildlife, including tiger. Please support our new appeal to create new corridors for wildlife. 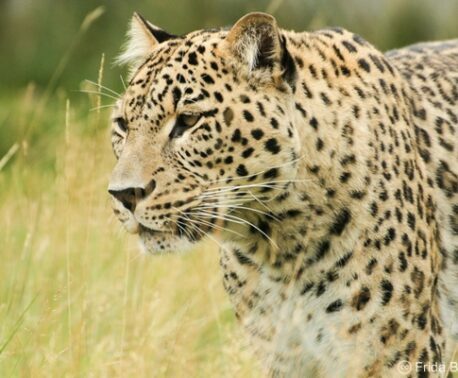 WLT and WTI are urgently looking to create new wildlife corridors in India and we have a donor who will match all donations, up to a total of £100,000. This means that we can be even more effective in saving wildlife, so please support this appeal and help elephants, tigers and other threatened species. We aim to raise £200,000 by 31st August this year to ensure that the next corridors can be created.